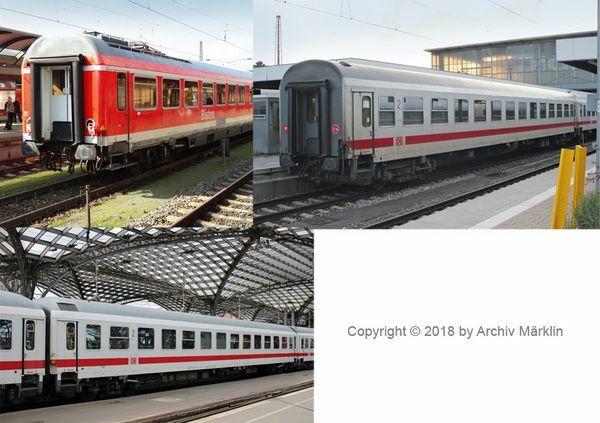 Prototype: German Railroad, Inc. (DB AG) South East Bavarian Railroad (Regio DB AG) type 264 express train passenger car, 2nd class, type Bimz 256 express train passenger car, 2nd class, in the current long-distance paint scheme, and type WRmz 135 dining car in the "Traffic Red" paint scheme. The cars look as they did in 2014. Use: IC and IRE, as well as PbZ (Special Purpose Passenger Service, i.e. a train to transfer cars from DB Long Distance Service and DB Regio between their places of use). Model: The cars have a close coupler mechanism. An interior lighting kit can be installed in the cars later. Total length over the buffers 495 mm / 19-1/2".